Anna Walentynowicz1 began work at the Lenin shipyard in Gdańsk in 1950, first as a welder, then as a crane operator. She developed a reputation as an activist, one among many emerging within a growing number of independent trade unions in communist-controlled Poland. 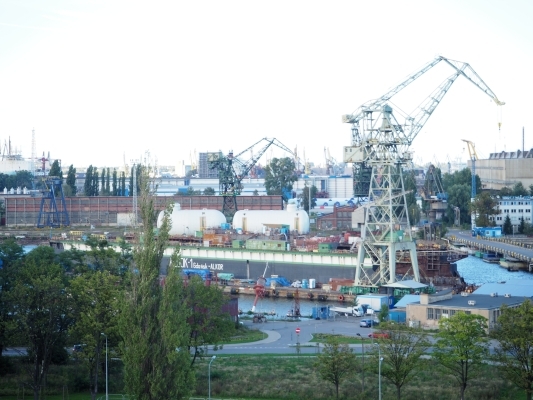 Seven days later her enraged fellow workers, in solidarity, staged a one-hour strike action at the shipyard, below.3 (Ula Poczwa was on the cargo ship iwanowrocław at the time. See her story on the war immigrants page). Within weeks, Solidarność registered as a trade union with 10-million members. The high representation of Poland’s urban workforce reflected their frustration with the government—sparked by a sudden increase in food and day-to-day goods in December 1970. The riots that followed—and their bloody crushing—spirited Anna and others into standing against that oppression, and the disheartening injustices of the regime. Cardinal Karol Wojtyła, who became Pole John Paul II, preached hope and encouragement during a pilgrimage to his motherland eight months after his appointment in October 1978. He acknowledged the difficult and turbulent times that ordinary Poles lived under. After the 1980 strikes, Solidarność negotiated permission to erect a monument to shipyard workers who had died in riots throughout Poland. Workers cast three steel crosses, weighing 139 tonnes, and each holding an anchor at the top.4 The turbulent years 1956, 1970, 1980 and 1981 feature predominantly. The monument is within site of the shipyard's cranes and stands outside the European Solidarity Centre, opened in 2014 and featuring the history of not only Solidarność but also other civil resistance and opposition movements that opposed communism in eastern Europe. Możesz go zabić narodzi się nowy Spisane będą czyny i rozmowy. The general malaise in Poland led many to consider their options elsewhere. Those who left in the 1970s and 1980s may not have had to endure three-month sea passages of those fleeing Prussian-occupied Poland a hundred years earlier, or endure the horrors of being kidnapped by Soviet soldiers in 1940 and 1941, but they still had to plan carefully. Three months later, members from several New Zealand unions demonstration in support of Solidarność. 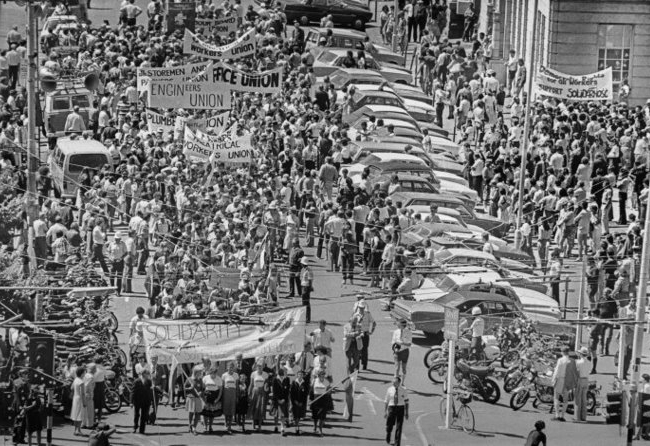 Phil Reid's photograph of the march from Civic Square in Wellington to Parliament, below, appeared in the evening post on 9 February 1982. Note the Solidarność banner on the top right-hand side. If you recognise yourself or someone else in the photographs, please get in touch with us through our home page. We welcome your stories. 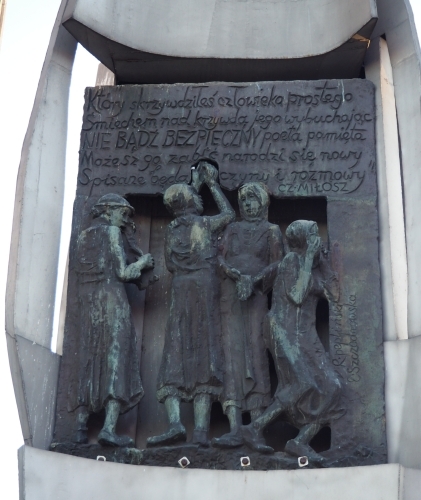 1 - An image of Anna Walentynowicz is part of a frieze depicting the lead instigators of the Free Trade Union, Coast (Wolne Związki Zawodowe, Wybrzeża, or WZZW) in the European Solidarity Centre in Gdańsk. Others are Bogdan Borusewicz, Andrzej Bulc, Joanna Duda-Gwiazda, Andrzej Gwiazda, Andrzej Kołodziej, Alina Pienkowska, Maryla Plońska, Kazimierz Świtoń, Lech Wałęsa and Krzysztof Wyszkowski. Anna Walentynowicz died on 10 April 2010 in an air crash outside Smolensk, Russia, that killed all 96 aboard an aircraft on its way to commemorate the Katyń massacres (See Jan Jarka's story on the war immigrants page). The dead included Polish President Lech Kaczyński and other state officials, military commanders and public figures. 3 - Photograph by Barbara Scrivens taken from the roof of the European Solidarity Centre. 4 - Photograph by Barbara Scrivens. If anyone has a better literal translation, please let us know. ... You can kill one, but another is born. 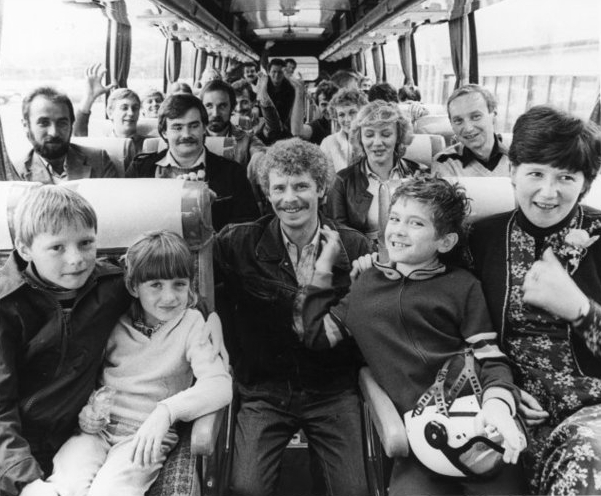 6 - Photograph taken by Merv Griffiths, Polish immigrants travelling to Polish House, Newtown, Wellington. Photographic negatives and prints of the Evening Post and Dominion newspapers, Ref: EP/1981/3597/18-F, Alexander Turnbull Library, Wellington, New Zealand. 7 - Photograph taken by Phil Reid, Polish Solidarity marchers in Civic Square, Wellington. Photographic negatives and prints of the Evening Post and Dominion newspapers, Ref: EP/1982/0409/21-F. Alexander Turnbull Library, Wellington, New Zealand.